The milk we work come exclusively from flocks of sheeps grazing free around Roman 'Campagna'. According to the season and the zone, the pasture has various characteristics of floral and aromatic composition. For this reason we will have a milk, and therefore a cheese, with characteristics that change according to the period of gathering (autumn, winter, spring). 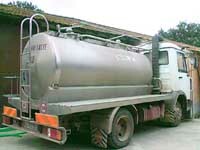 The gathered milk is carried to the factory and there it is treated in ways which differs according to the type of cheese that must be produced. For cheeses made with pasteurized milk, the milk of the evening before and the one of the morning, are mixed, filtered and placed in refrigerator at a temperature of approximately 3�C in order to be treated the morning after . For cheeses made with not-pasteurized milk, the milk of the morning is gathered, filtered and worked within 4 hours from the milking. Pasteurized milk. It is transferred from the refrigerator to the bathtubs for pause. The pasteurizing occurs at a temperature of approximately 70�C.Then the milk is transferred in the processing boilers where lactic fermentsare added. After approximately 15 minutes, the milk is taken to a working temperature which changes according to the product to be obtained. Then the rennet is added and after 30-50 minutes the curd is ready.The breaking of the curd is made to obtain pieces of various dimensions according to the cheese we have to make. Sometimes, during this procedure, the working temperature is increased of approximately 1�-5�C. The paste rests for some minutes and then it is transferred in the stamps to be subsequently drained in the bathtubs for stifling at a temperature of approximately 28�-30�C where it remains for some hours. It is then kept at room temperature in order to complete the clearing of the serum. After approximately 6-8 hours the brining is processed. Not pasteurized milk. As soon as arrived at the cheese factory, the milk is strained and transferred in the processing boilers. It is then taken to the working temperature (approximately 36�-39�C). Then the rennet is added: thistle's flowers rennet for the ' Cacio Fiore di Columella', lamb rennet for the 'Pecorino' and the 'Pressato a Mano di Columella'. The curd obtained with thistle's flowers is broken off manually in phases; first in large pieces and after approximately 20 minutes the second breaking off with a pierced ladle takes place. It is then deposited in containers in order to make the serum clear. The day after the brining is processed. In the Pecorino the curd obtained with the lamb rennet is mechanically broken off in very small pieces and taken to a temperature of approximately 44�C. After a short pause, the paste is put in the stamps and pressed by hand in order to facilitate the clearing of the serum. After approximately 24 hours the brinig is processed. The "Pressato a mano di Columella" is treated in a slight different way: after 1 hour and after the rennet is added, the curd is broken off in pieces as small as a rice grain. 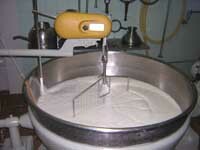 After having rested for approximately 20 minutes,the curd is transferred in a container with hot water where it is manually pressed in order to eliminate all the serum. Later on it is transferred in pickling brine. Ricotta. The serum obtained from the manufacturing of cheese, is taken to a temperature of approximately 70�C. Then sheep's milk is added in order to make 'Ricotta' more creamy. The 'Ricotta' comes out at a temperature ofapproximately 85�C, forming a stratified white mass. The baking process ends at approximately 100�C. After a short pause the mass is taken out. After approximately 3-4 hours of clearing the 'Ricotta' is ready. Dry brining (by hand). This type of Brining is used for seasoned cheeses like the Pecorino, or for cheeses with soft paste, like the 'Cacio Fiore di Columella'. For the 'Pecorino in Grotta', the brining is made after 24 hours the date of production, in natural caves. The cheeses are put on wood boards: they are covered with salt from 3 to 5 times, then they are left to dry for 2 or 3 days, then they are carried in climatized rooms for 15-20days. Finally they are transferred in natural caves for the seasoning, for 8 to 18 months. As far as the Pecorino, the brining is made after 24-48 hours from the production. This is a delicate phase because large cheeses, of approximately 20-25 kg, must be sprayed with salt in uniform way to variable intervals in order at least 5 -7 times, for a period comprised between the 30 and 40 days. Finished the brining, the cheeses are washed and put to dry for some days. During all this period the cheese remains always closed in particular containers called "fasciere". In this phase Pecorino is ready for the seasoning that happens in climatized rooms. The seasoning can last from the 6 months to beyond a year. 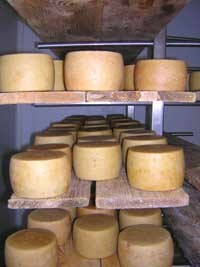 During this phase the cheeses are turned again and abraded periodically. The Cacio Fiore di Columella comes by is salted manually after 24 hours from the production, at room temperature: they are covered with salt for 2 or 4 times. It is then left in the stamps to drain for approximately 5 days. Subsequently it is transferred in the seasoning rooms for approximately 30 days at a temperature of 10�C with umidity of 90%. Finished the seasoning the cheese is ready for the use. Pickling brine. This type of brining is made for the 'Pressato a Mano di Columella', the 'Caciotta', the 'Canestrati', the 'Soldo diCacio' and the 'Spicy Cheeses'. The shapes remain in the bathtubs of brining with a relation of 6-8 hours for kg. Then they are transferred in natural rooms for 3-5 days, where they are let to dry. Subsequently they are seasoned at controlled temperature and umidity. In according to the type of product the seasoning will last from the 20 days to beyond 6 months. During this period the cheeses are turned again and washed.